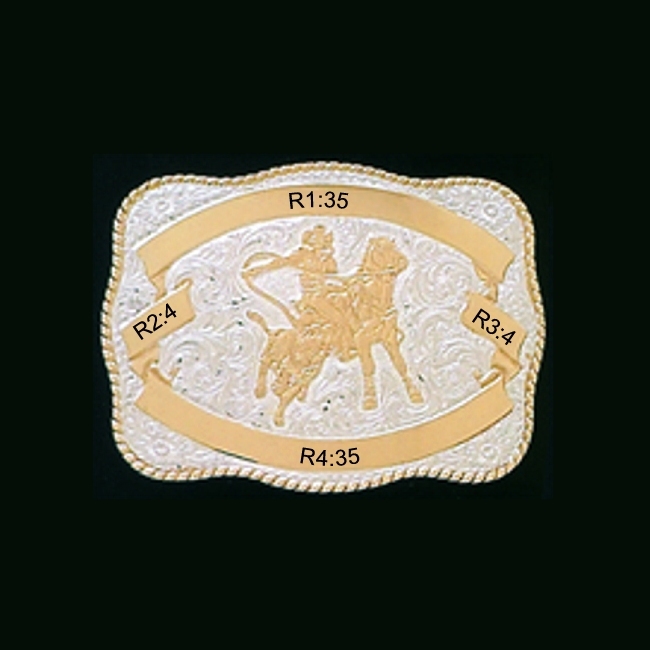 CR-04657 Crumrine® Embossed Trophy Buckle - Rectangular - Calf Roper - 4 ribbons 3-1/4" x 4-1/2"
Embossed Rectangular Trophy Buckle, Silver Plated, 3-1/4" x 4-1/2"
Choose Custom Engraving Available or choose "No Engraving Required" and have an experienced local engraver engrave it for you. The buckle ribbons are desinated on the image a R1, R2, R3, etc. The number after the ribbon designation is the maximum number of characters permitted in that ribbon. R1:35 designates that ribbon R1 can have a maximum of 35 characters. R3:8 designates that ribbon R3 can have a maximum of 8 characters. Add the information below that you would like custom engraved into the "Ribbon R1" Text Box, 35 maximum. Add the information below that you would like custom engraved into the "Ribbon R2" Text Box, 4 maximum. Add the information below that you would like custom engraved into the "Ribbon R3" Text Box, 4 maximum. Add the information below that you would like custom engraved into the "Ribbon R4" Text Box, 35 maximum. Count the number characters and place the number into the "Number of Characters" Text Box (78 total maximum). Choose "Custom Engraving" from drop down. A Flat Fee of $40.00 is charged for Custom Engraving up to 78 Characters maximum total. This Buckle is Made-To-Order so please allow 8 - 10 weeks for delivery with or without Custom Engraving..